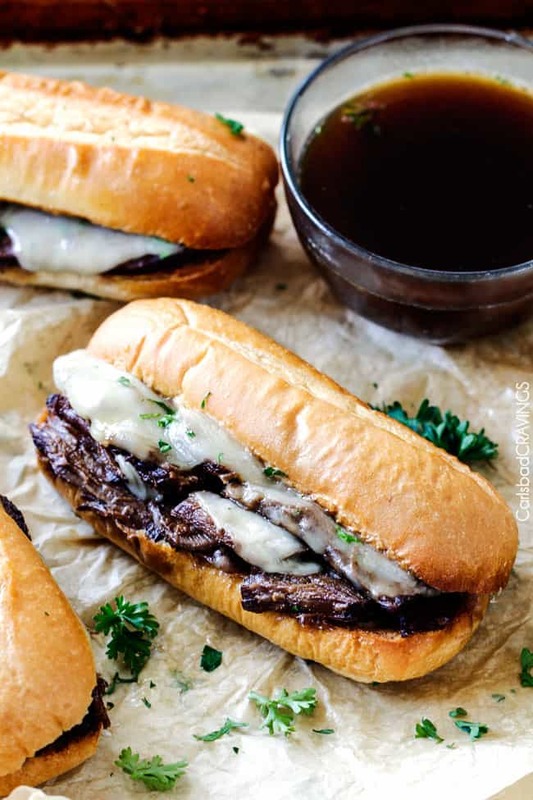 Crazy tender Slow Cooker French Dip Sandwiches seeping with spices are unbelievably delicious and make the easiest dinner or party food! 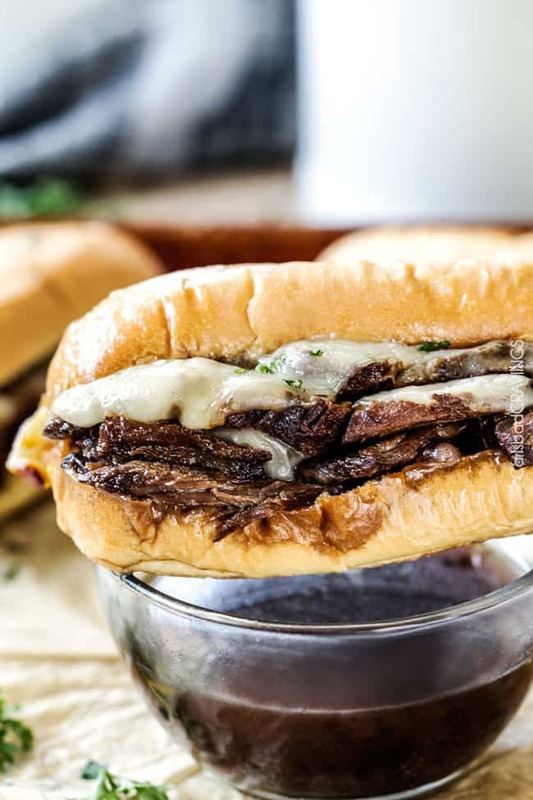 You haven’t had a French Dip Sandwich until you try this French Dip Recipe! These French Dips have rave reviews for a reason – they are rave worthy! The meat is cooked low and slow, sliced then put back in the slow cooker so it drinks up all the juices and becomes melt-in-your-mouth tender. Pile that juicy beef on to a golden toasted bun smothered with gooey cheese then dunk in flavor bursting au jus and you quite possibly the most delectably delicious bite of. your. life. Who invented the French dip sandwich? The French Dip Sandwich did not originate from France but it’s originator, Philippe Mathieu, was French. Phillipe owned a sandwich shop in Los Angeles, Philippe the Original that is still around today! According to the story, Philippe was making a sandwich for a policeman and accidentally dropped the sliced French roll into the drippings of a roasting pan. Instead of getting new bread, Phillipe served dipped bread and the policeman loved it so much he returned the next day with friends requesting all of their sandwiches be dipped in the meat drippings – and that’s how The French Dip Sandwich was born. 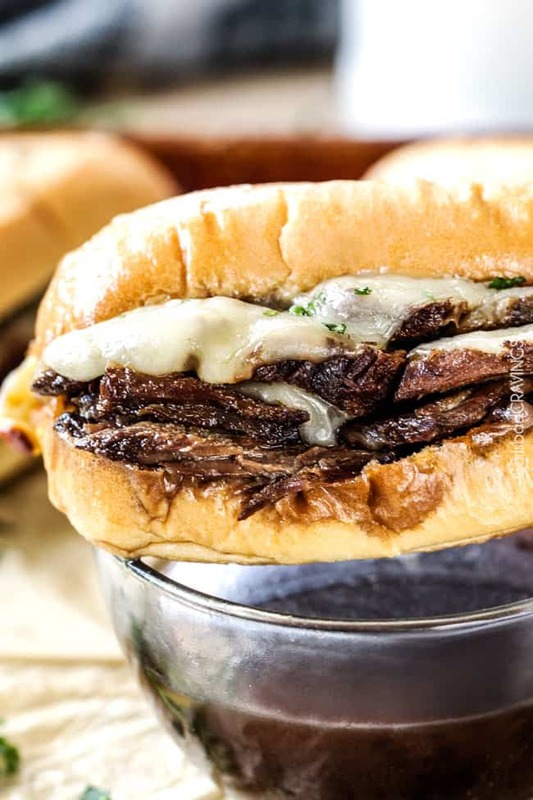 I had high expectations for my French Dip Sandwich recipe but this French Dip is sooooo good, I am going out on the limb and calling it the BEST French Dip Sandwich Recipe out there (update: hundreds of you agree by the comments – thank you!). How do you make French Dip? 2. To achieve such melt-in-your-mouth tenderness, the roast gets cooked low and slow for 4 hours, then sliced thinly while it is mostly cooked but still firm enough to hold together. The roast slices continued to cook for another 2 hours, so the seasoned broth can permeate every centimeter of the thinly sliced meat, leaving you with the most unbelievably tender, flavorful beef. 4. Dipping our French Dip in best au jus sauce! The leftover slow cooker savory juices further penetrate the meat and the bun leaving it delightfully drippy and drenched in more flavor. And then the best part – soft golden bread, melty cheese, savory crazy tender beef – in-your-mouth. mind. blown. Serve your French Dip Sandwiches with Million Dollar Macaroni and Cheese, Wedge Salad with Blue Cheese Ranch, Creamy Bacon Pea Salad, Baked Beans with Brown Sugar and Bacon, Baked Parmesan Fingerling Potato Fries and/or Perfect Fruit Salad for a night never to be forgotten! 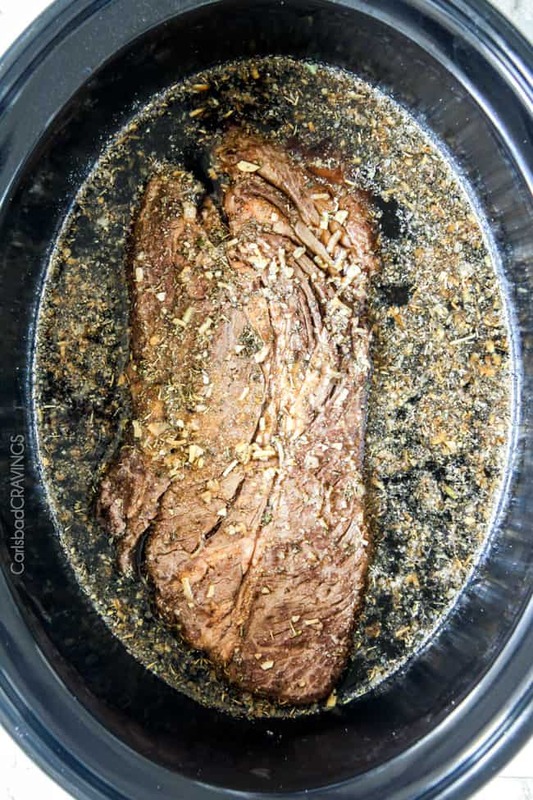 Looking for more slow cooker beef recipes? 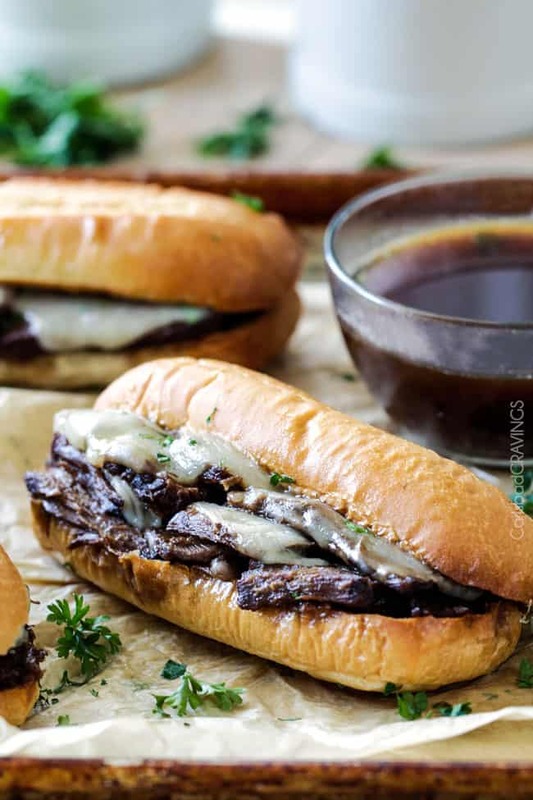 Crazy tender Slow Cooker French Dip Sandwiches seeping with spices are unbelievably delicious and make the easiest dinner or party food! The meat is cooked low and slow, sliced then put back in the slow cooker so it drinks up all the juices and becomes melt-in-your-mouth tender. 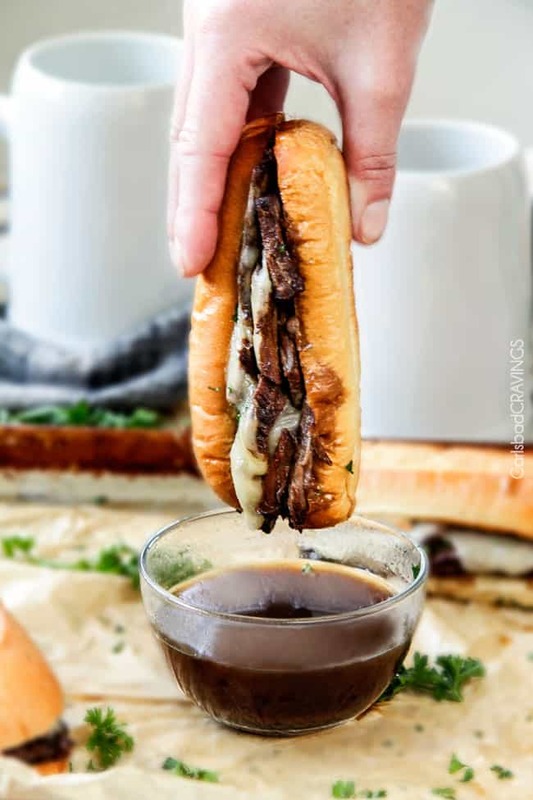 Pile that juicy beef on to a golden toasted bun smothered with gooey cheese then dunk in flavor bursting au jus and you quite possibly the most delectably delicious bite of. your. life. Heat olive oil over medium high heat in a large nonstick skillet. Using two forks or tongs to hold roast, sear on all sides until lightly browned. Add to slow cooker and top with all remaining Slow Cooker ingredients. *The beef can be more or less than 3 pounds, but 3 pounds is roughly the amount for 6 sandwiches. **Beef consomme can usually be found in the canned section next to the beef broth OR the soups. If you can't find it make sure to ask someone. If your store doesn't carry it, you may substitute beef broth. Where do you get dry minced onions? is that dry onion soup mix? can i substitute this with regular onions? Hi Stephanie, you can get them at any grocery store with the spices. They are not the soup mix but will just be called “mince onions.” You can use one regular onion but I prefer the punch of the dried onions. I hope that helps! First of all, i just want to say that i’m a massive fan of your website and you have rekindled my love for cooking so thank you! Made this recipe last night and it was delicious! The only thing is that it turned out quite salty when you dipped the sandwich into the sauce. I’m not sure where i went wrong as I followed the recipe exactly. Do you have any tips as to how i might be able to cut back on the salt, and how much exactly? Thank you so much for your kind words Stephanie! Did you happen to not use low sodium soy sauce? If you did and it was still to salt then just omit the salt in the recipe next time. Enjoy! Can’t wait to make this tomorrow! Just one question…when it says 1 tbsp beef bouillon how do I do that when all I have is the bouillon cubes which are one cube=one cup. 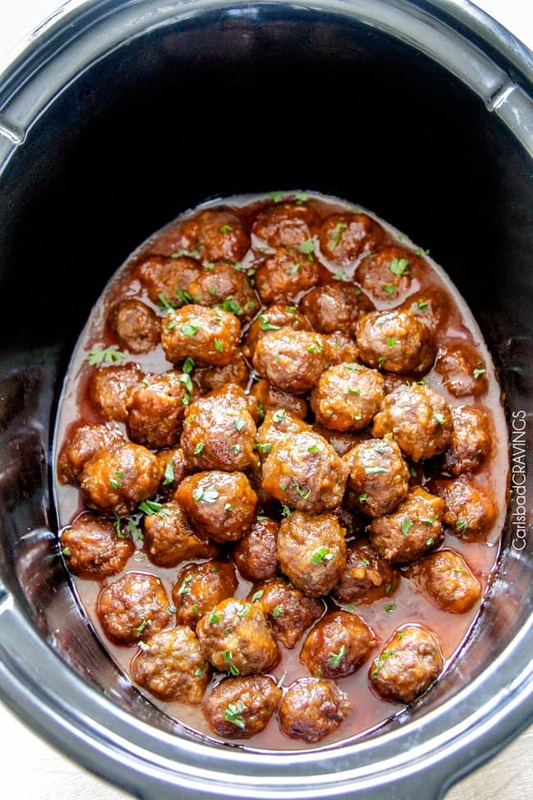 Would you just make it and then take a tbsp from that and add it to the crockpot?? Haha I feel dumb for asking but I don’t want to screw it up! Not a dumb question! I believe one cube equals 1 teaspoon so you would need 3 cubes. Enjoy! So I got better than boullian cause I could find consume, and I got boullian and not sure what to do! I would use beef stock instead of beef consomme and then use either the better than bouillon or the bouillon cubes/powder but not both. I hope that helps! This recipe was incredible! 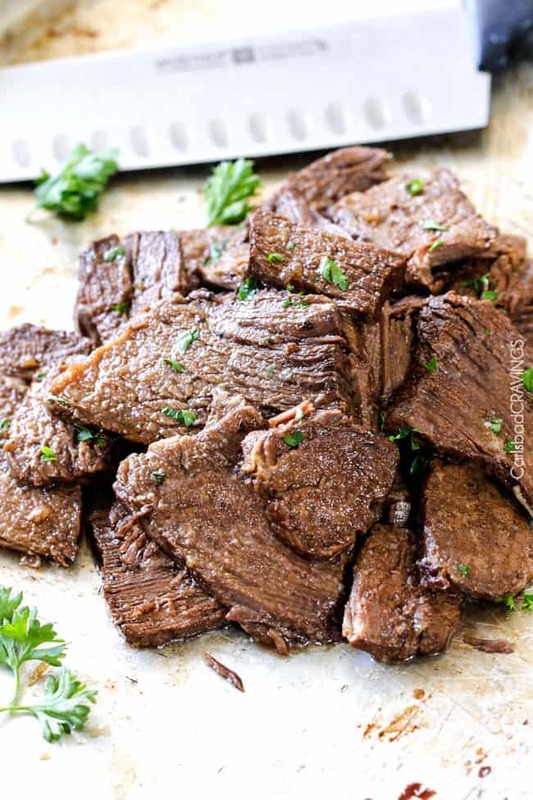 I’ve been searching for a good chuck roast slow cooker recipe for ages, and this one was amazing with the super moist and tender beef combined with the intense flavor (your dry minced onions, brilliant!) of the au jus was exceptional! I always try out good recipes I find online, but sadly too lazy to leave comments, but I just had to say thank you bc this recipe was simply outstanding. Also, I read your story, and you are truly an inspiration! Thanks again for sharing both your story and your fabulous recipes! Thank you for taking the time to read my story, make my recipe and comment Flora! I’m thrilled you loved this recipe so much! I hope you continue to enjoy exploring my site and finding new favorites! The cans of beef consommé I found are condensed; they are supposed to be diluted with water before heating & eating. Is this what I should use? Two cans undiluted consommé? Hi Suen, I believe all beef consomme (at last Campbell’s) are condensed so no you don’t need to dilute it first. Enjoy! I have made this multiple times now in the past year. It’s absolutely hands down the best recipe for French dip that I have ever made…and I’ve been cooking for 40 years. In the past I tried several other recipes including one that called for beer, but I didn’t like the flavor the beer imparted. Hence I kept searching until stumbling on this recipe. After reading the ingredients list I had a feeling it would be a winner and BOY is it. After telling my married daughter about the recipe she tried it out and agrees that it’s definitely a keeper. Thank you. Thank you for your awesome comment Jan! I am humbled and honored that this is the best French Dip recipe you’ve tried after a 40 year search! Thanks for making my day and for passing my recipe along! 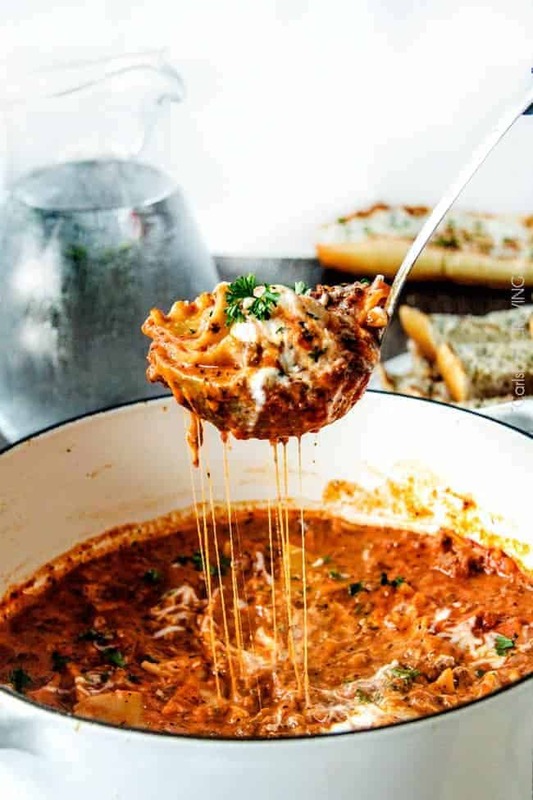 Hi Jen, do you know if this recipe converts to a pressure cooker version for an instant pot? I love this recipe so much, but my family is impatient. 🙂 Thanks so much! Hi Flora, I am not an expert at the instant pot – I will work on a version and let you know!